The DSG01 is a compact and smart module that will turn your PC or laptop into a fully-functional Digital Oscilloscope , a Programmable Signal Generator and a Frequency Spectrum Analyser. No more heavy, expensive, dangerous (high voltage), power hungry and large footprint analogue scopes, instead an elegant, small, low power, fully featured and safe piece of equipment that will upgrade your lab instruments within an affordable budget. Ideal for capturing once-occurring events not possible with an analogue scope, the DSG samples at up to 20 or 30 Msps with a buffer size of 32 Kbytes. It will generate sine, square, triangular and saw-tooth waveforms in normal and sweep formats. The signal generator is programmable to generate any waveform and supports data input from captured signal, a text (.txt) file or Microsoft Excel. 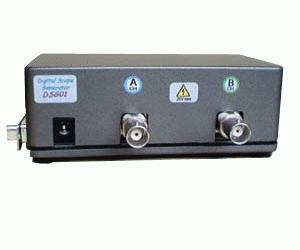 The spectrum analyser allows quick display of spectral frequencies of the captured signal. With the combined Scope and Generator functions, the DSG becomes a versatile component tester. Plugs straight into a PC printer port*, DSG provides another use for redundant PCs or laptop (notebook).